If cremation is final disposition, we cannot fully serve our communities when they need us most. Legally, cremation is regarded as final disposition almost everywhere. However, even in places where there are laws on the books requiring placement in cemeteries, such laws are typically not enforced. Historically, these laws were promoted by funeral directors and cemeterians who held certain assumptions about cremation families. Conventional wisdom dictated that cremation families didn't want ceremony and were focused on price—and therefore not worth the attention of an experienced funeral director. Thus, the laws were designed to protect traditional funeral service elements: casket, wake, clergy service, burial, graveside. Even the FTC Funeral Rule was created along those lines, requiring price disclosure of funeral elements but only addressing cremation as one item—direct cremation. Our assumptions that cremation and funeral were diametrically opposed created the concept of “direct cremation.” On top of that, the laws that were enacted did more to teach the public that cremation doesn’t need service or burial than they did to prevent cremation’s rise in popularity. And the public continues to choose cremation. So, after decades of telling the public that they don’t need our service and treating cremated remains as final disposition, how do we expect to change public perceptions now? I’m not the first to say it, but this is a polarized profession. On one side, there are those who embrace the whole spectrum of cremation, from direct disposition to full service. The other side doesn’t believe in cremation and doesn’t understand the experience of the family beyond the transaction. Unfortunately, you can’t sell what you don’t believe. Tacking “Cremation Services” on to your company name by contracting with the local third party doesn’t mean cremation families will flock to your business—especially if you don’t understand why they’re choosing cremation in the first place. For too many in the industry, cremation is fine on their terms: “Cremated remains can be buried—in fact you can even place two sets in one space!” Or “A wooden casket can be cremated and you can have the body present at a visitation and service prior to cremation.” Both of these statements are true and many families may find comfort in these rituals—but they aren’t the only truths. They’re not the only path toward healthy grieving and gathering. Other providers segregate our communities by the labels of “traditional” or “cremation” because they “figured out what cremation families want” and it’s a transaction, not an experience. The resistance to creativity and personalization under the guise of ritual and dignity has done even more damage to consumer attitudes than regulation has. Consumer watchdogs reinforce the assumption that cremation is merely disposition. Their arguments make cremation about price, where “dealing with the body” should be as cheap as possible to avoid being taken advantage of by funeral directors. Worse, funeral directors reinforce this by starting the conversation with pricing and not service. Low-cost, direct disposers succeed by speaking directly to cremation families in the same language as the media and watchdogs, reinforcing that funeral directors and cemeterians are mercenary and superfluous. All this propaganda leaves consumers fearful and confused. Cremation is supposed to be simple! Complete some paperwork, make a few basic decisions, and take home a box—with little guidance and support, let alone memorialization ideas (and forget about any mention of permanent placement altogether). In pop culture, memorialization is reserved for the military or the wealthy and scattering is the option for everyone else—other than maybe a fancy urn on the mantel. The funeral director’s expertise is absent. Then there is the stereotypical funeral director. All stereotypes have a kernel of truth, otherwise they would be absurd and implausible instead of funny. The creepy, morbid, silent man in a black suit standing in the back of the room is funnier than a man or woman directing and educating the family in options to create a meaningful experience and finding a meaningful place for the remains to rest. But we created this problem. There is no point in blaming hospice, Hollywood, or the watchdogs. 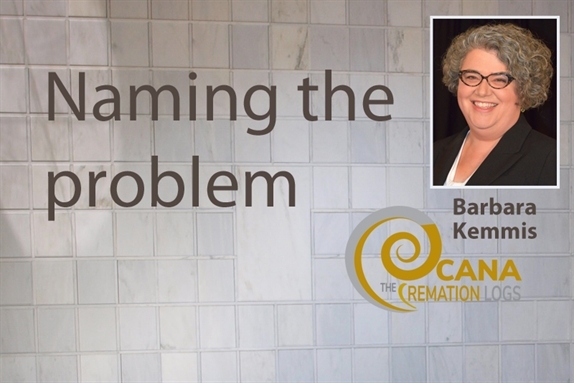 Funeral directors, cemeterians, death care trade associations— we created this problem, and we need to find the solutions. Public trust is at an all-time low for institutions across the board. This is hard for funeral directors as first responders relied upon to serve people at need and anyone in the industry trusted with the memory and the finances of a loved one. Building trust is about transparency, communication, and apologizing when you’re in the wrong. In our industry, we have to go one step farther and educate the consumer about what we do. We can’t let watchdogs and the media tell our story and we have to demonstrate how we contribute to the public service. Building hospice and health care partnerships centered around grief services is brilliant. Maintaining a level of continuity builds the trust in the expertise of professional care. Too often, when somebody dies, health care’s job is done except for the paperwork. The grief services dictated by Medicare, delivered in conjunction with funeral homes, provide an opportunity to develop a relationship with a family and educate them about options. They’ve become used to the level of support and care of the medical profession, so abruptly turning the conversation to the transaction of a direct cremation is too jarring. We can do better. Funeral home and crematory staff are more than happy to help a family to their car with a box of cremated remains. Would you do the same with the casketed body of their loved one? Why are cremated remains so different? Where is the reverence and the ceremony? Expert Celebrant Glenda Stansbury’s concept of infusing ceremony into every interaction with families includes the moment the cremated remains are retrieved from your care. We need to remind ourselves to maintain the respect for the cremated remains. Knowing you’ve helped to lay remains at a gravesite offers a sense of closure and security, so why not ask where the cremated remains are going? Chances are good that you’ll be able to provide the same closure and security if you offer useful ideas. Cemetery placement is only possible if the cemetery embraces cremation, too. Cemeterians—have you truly updated your cemetery rules and regulations to accommodate a cremation age? Do you offer multiple memorialization options—burial, above ground niches, benches, ossuaries, scattering, and memorial walls for those who scattered elsewhere? If 60-80% of cremated remains go home, there are millions of boxes sitting on shelves and guilty family members cringing every time they see that box. They have a problem and you have a solution. You can help remove their guilt, offer closure, and lay their loved one at peace—even years after the death. I recognize that this is the toughest market in which to communicate value, but the recent consumer media frenzy about maintaining clean cemeteries demonstrates that people worry about perpetual care and they abandon their loved ones at funeral homes because they know they’ll be safe there. A recent speaker at a CANA event called cemeteries the “biggest museums in the world” with “more history in them than a lot of other places” and genealogical information for generations. Your role has never been more important, and framing it that way is key. You’ll notice none of my proposed solutions attempt to convince the consumer they’re wrong. That tradition is the best, that cremation is bad. Partially that’s because I work for the Cremation Association of North America, but mostly it’s because cremation is a bell that cannot be unrung. The cremation rate passed 50% in 2016 and will not revert. In our industry’s past, we tried to partition families by their burial and cremation preferences. Now, we have to unteach the public and ourselves. There’s no such thing as “just cremation.” Compassion, service, options, grief, problems, solutions, and placement are relevant to every death, no matter the disposition. But solutions only work if we believe we can solve the problem, and if we can meet the family’s needs. All CANA members can benefit from community outreach and consumer education programs by using the PR Toolkit to develop a strategy. Not a member? Consider joining your business to access tools, techniques, statistics, and advice to help you understand how to grow the range of services and products you can offer, ensuring your business is a good fit for every member of your community – only $470!